The Department of Science and Technology (DOST) and the Philippine National Railways (PNR) launched on June 25, a new hybrid train that is proudly locally made. The train was developed by an all-Filipino team of engineers and technicians at DOST's Metals Industry Research and Technology (MIRDC). 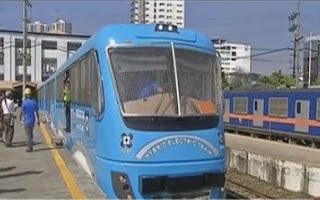 The hybrid train has a diesel and electric power system and reduce fuel consumption by half. The project cost P120 million for the conceptualization, research, and manufacturing, according to CNN Philippines. 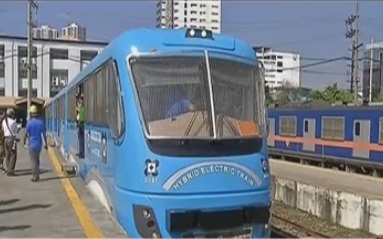 The launching of the prototype was held at the PNR Tutuban station in Manila. It has five air-conditioned coaches, each one able to accommodate up to 220 passengers. MIRDC Executive Director Robert Dizon said that the hybrid train is still on its testing stage. It will undergo safety tests before it can be offered for regular public use. If the hybrid train passes intensive tests, there could be a chance that it would be mass produced. According to Inquirer, VP Glicerio Sicat of Meralco's subsidiary MRail, said that they have an agreement with DOST for the mass production of the hybrid train if it passes rigorous tests. DOST Secretary Mario Montejo said the operational testing of the train will take 3 to 6 months. Judging from the reaction of netizens on CNN Philippines' short video feature about the hybrid train, the public is very receptive about it. The video has gone viral, gaining more than 850,000 views on Facebook in less than two days. Commenters are pleased with the fact that the hybrid train is locally made. They are hoping that with the help of the private sector, it will go into mass production soon. Netizens also expect the hybrid train to ease the traffic congestion in Metro Manila.